We took that little vacation to Taos and Santa Fe- and we had a blast. So much fun. Then when we got home, I had that week off from work, and I DID tackle my scraps- more on that later. We also started the super fun project of cleaning out our very very very cluttered garage. And Annie had a performance of The Tempest. And Henry had middle school orientation. We’ve been running around like crazy- and I haven’t been blogging at all. I also haven’t been sewing at all. After I cleaned up all the scraps- hooray! !- I got buried again. Part of the garage de-clutter is dealing with all my clothes. I’ve slowly but steadily put on weight over the years, and I have a lot of smaller clothes stashed for “one day”. Well, I’m down over 20 pounds in the last 5 months! Most of what’s in my closet currently is too big, and so it was time to go through the skinnier clothes. The sewing room is currently ground zero for sorting- fits now, will hopefully fit soon, and too big so time to donate… Phew! 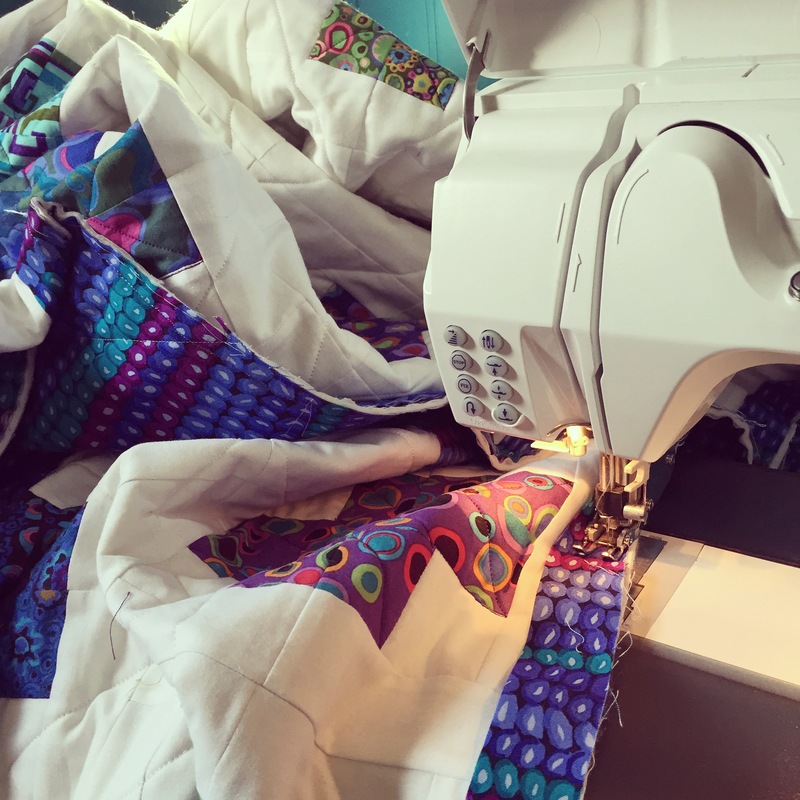 But… on Friday my quilter delivered my Modern Cross quilt! 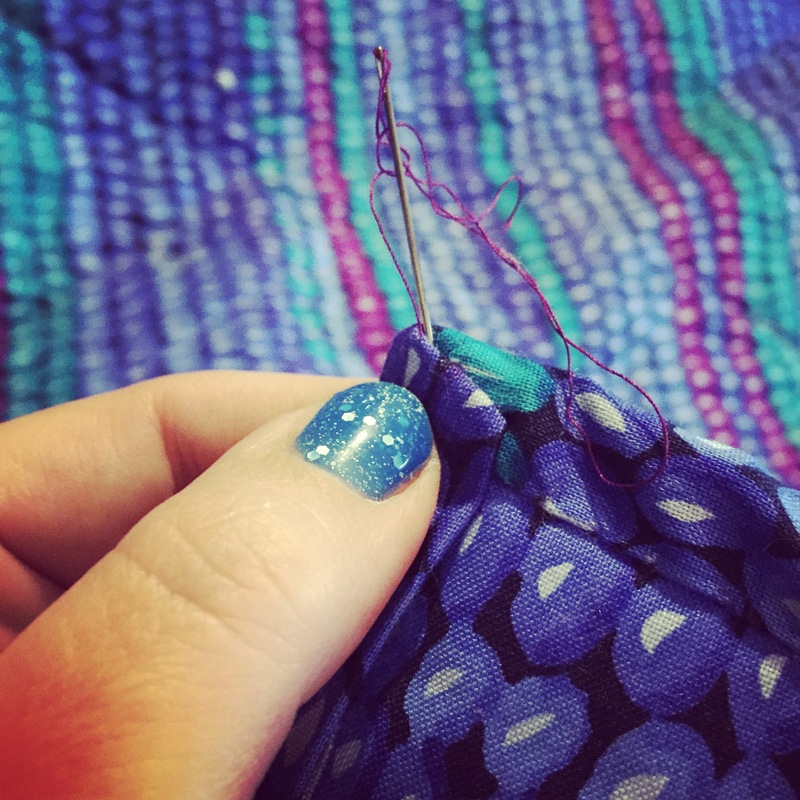 So I did dig my way through the mess to get to my machine, so I could start the binding. Just squaring it up, at around 95×100, was a slightly Herculean feat. I decided to use leftovers from the backing for the binding. The colors were just right, and I only had to cut and join 5 strips. Then there was the joy of shoving it through my machine to attach the first side of the binding. I settled in for some serious handwork. But at least one of my all time favorite ever movies was on TV. And in an aside, look at this awesome little present I bought myself last week. 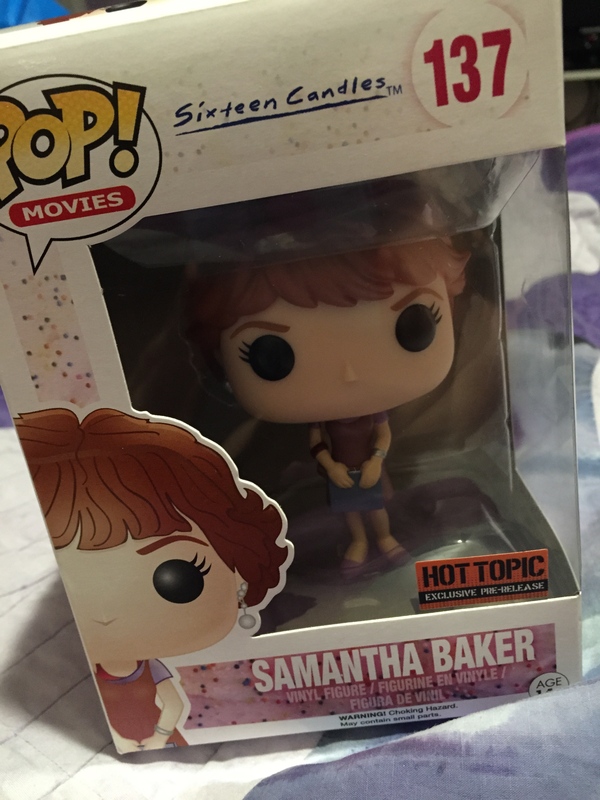 Now all I need is Jake Ryan for my life to be complete. Of course, then I need to sew on all the buttons- one for the center of each cross. 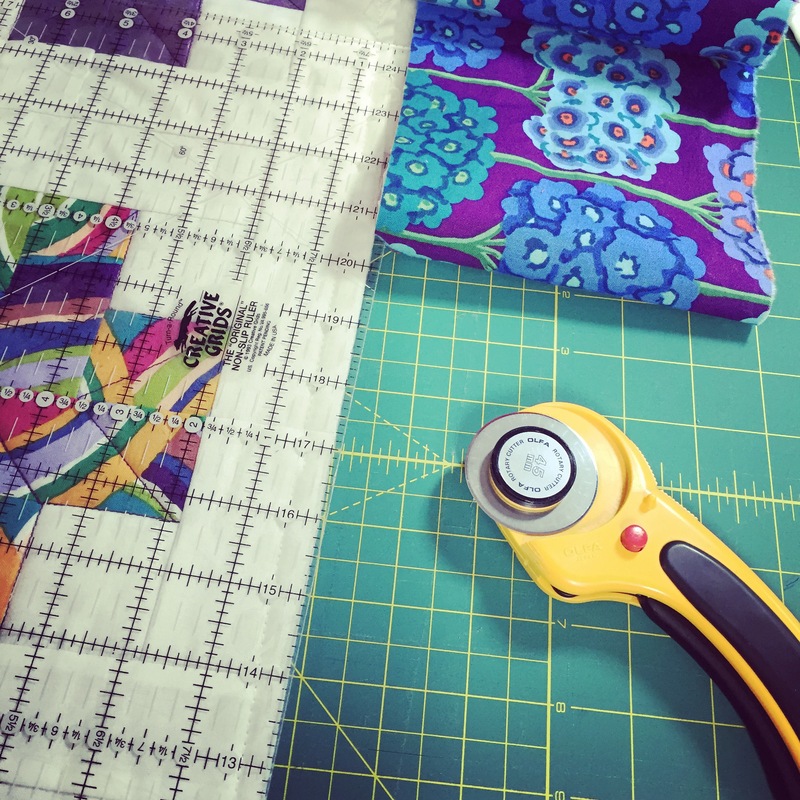 Meanwhile, linking up with Sew Cute Tuesday, WIP Wednesday, and Let’s Bee Social. Life would be better if we all had Jake Ryans in our lives. Good Lord! That thing is gargantuan! but it looks great and looks just what I need for my bed… hmmmm… Congrats on the wight loss, I am in serious envy. It is a super sized king, and I think, the biggest quilt I’ve ever made! Isn’t it fun to be looking for smaller clothes instead of the opposite! But you title gives me a guild trip because I am doing email/blog reading instead of finishing the binding on my quilt. Uh oh. It’s a lot of fun to rediscover old, smaller clothes- and to pack the larger ones up to donate! Scary to give them away, in case I need them again, but hopefully, this will keep me from backsliding. Your IG feed certainly looks like you’ve been having a lot of fun of late. I can’t wait to see what the quilt looks like when it’s all finished. Also, if you have time, please share some of your favorite Santa Fe experiences with me. We’re thinking about spending a few days down there in the near future and would love some recommendations. I’d be happy to tell you all about our fave places in Santa Fe. What type of things do you guys like on vacation? And do you use Trip Advisor? I like historical sites and museums. Nick’s pretty happy to do whatever. I use trip advisor a little. Have you left a ton of reviews there? I like historic sites and museums; Nick likes things he can photograph. I use trip advisor a little. I spend most of my holiday time visiting folks back at home, so I tend to not need it a whole lot. Beautiful quilt! Now I’m feeling guilty, too, and must be off to bind a baby quilt! That big quilt must have kept you busy for quite a will with the handwork! Congrats on getting to the binding stage! From the glimpses here, you have some gorgeous fabrics in your Modern Crosses quilt and a beautiful backing. Can’t wait to see it all finished! PS – I love Taos & Santa Fe too. Hope you enjoyed your trip! Taos and Santa Fe are two of my fave places 🙂 We had a wonderful time. Hand sewing the binding is one of my favorite parts- I find it so satisfying. Oh it’s beautiful!!! Those purples are so vibrant against the white. I hear ya on shoving the quilt through you machine, it’s my most disliked point in the process! 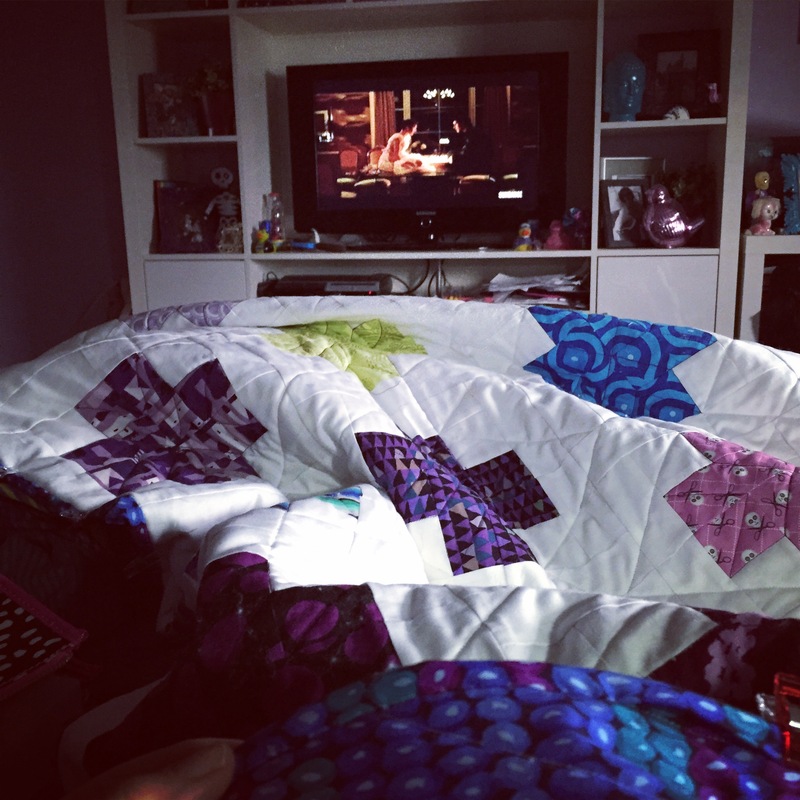 I don’t even like it with smaller quilts, but when they get so big, it’s awful! This is an exciting post! Yay for the quilt! Yay for weight loss! Yay for a trip! Yay! The binding looks great. Congrats on the weight loss. I’m on that journey too – just not as far as you, but wearing a skirt and top today for the first time in three years. PS love your nail polish! Getting back into old clothes is the best 🙂 Congrats to you as well! PS the best part of the nail polish is that it turns dark purple when cold! You may not have been blogging, but you have been busy. Congratulations on the weight loss, and the fact that you’re very nearly finished the quilt! 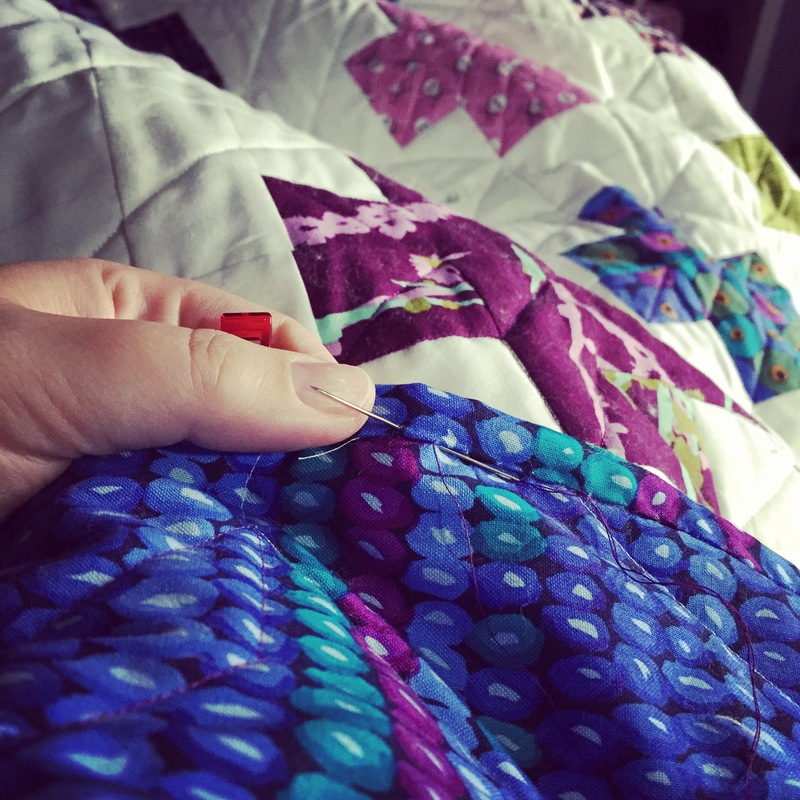 Thank you for linking up with Sew Cute Tuesday.